October 21, 2013 - The Gulfstream G650 recently completed the fastest westbound, around-the-world flight for a non-supersonic aircraft. The ultra-long-range, ultra-large-cabin company flagship circled the globe in 41 hours, 7 minutes, establishing a world record in the C-1.l aircraft class. The record was officially certified by the National Aeronautic Association (NAA) and the Fédération Aéronautique Internationale in September. The G650, the fastest certified civilian aircraft, recorded an average speed of 568.5 miles per hour (915 kilometers per hour) on the journey, claiming 22 city-pair speed records in the process. The G650 now has a total of 38 records since setting its first (Burbank, Calif., to Savannah) in January 2011. The G650’s 20,310-nautical-mile around-the-world journey started and ended in San Diego, with stops in Guam, Dubai and Cape Verde. Each leg was flown at Mach 0.90, the standard high-speed cruise setting for the aircraft. Five pilots shared crew duties over the four legs of the journey. The record attempt kicked off at 9:08 p.m. local time on July 1, with the G650 leaving San Diego’s Brown Field Municipal Airport. After crossing most of the Pacific Ocean, the aircraft landed at Guam International Airport in 10 hours, 29 minutes. The flight crew consisted of Horne, Bud Ball, John McGrath, Ross Oetjen and Eric Parker. Each was on the aircraft for the duration of the flight. The G650 also carried Kris Maynard as the official observer for the NAA. Gulfstream personnel who assisted the flight crew along the route were Bruce Egart and Les Lawrence in Guam; Ahmed Ragheb and Alberto Bernaola in Dubai; and Michael Jarrett and Keith Powell in Cape Verde. In addition, more than 30 company employees were involved in the planning and execution of the record flight. 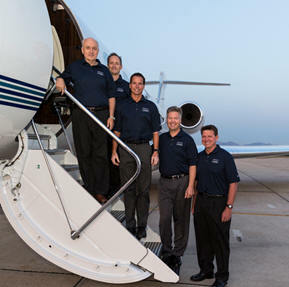 Fixed base operators San Diego Jet Center, Guam Flight Services, Jet Aviation Dubai and Cape Verde’s Safeport Executive made sure the G650’s ground times were minimal. The C-1.l class is for aircraft with takeoff weights of 77,162 to 99,208 pounds. The G650 joins the Gulfstream IV on the NAA’s around-the-world record rolls. In 1987, the GIV circled the globe in 45 hours, 25 minutes, a mark that still stands in the C-1.k aircraft class (takeoff weights of 55,116 to 77,162 pounds). The GIV also holds the same classification’s eastbound record of 36 hours, 9 minutes set in 1988. The G650 offers the longest range, fastest speed, largest cabin and the most advanced cockpit in the Gulfstream fleet. The G650 can travel 7,000 nm at 0.85 Mach and has a maximum operating speed of Mach 0.925.